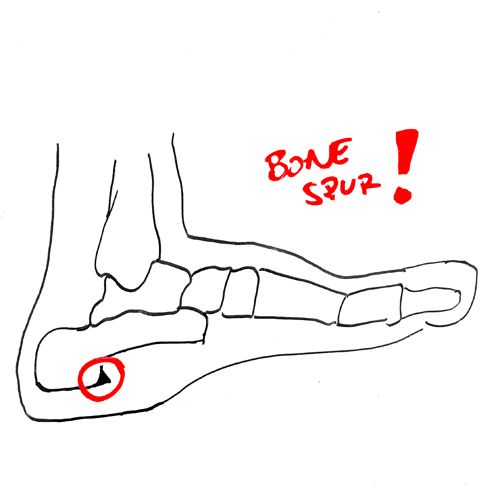 Home » Bone Spur in the Foot? Respect All Variables. Bone Spur in the Foot? Respect All Variables. 22 Aug Bone Spur in the Foot? Respect All Variables. Author’s Note: This post dives into how the human body wears + degenerates, using the problem of a bone spur. Be warned, it goes deep. I link to other posts to fully define terminology. If you’re not one for going deep, skip this one. Do you have a bone spur in your foot? A bone spur is an excessive overgrowth of bone somewhere in the body. It is an adaptation resulting from excessive stress on that bone. The bone spur is a smart response from the body when the muscles, ligaments, and tendons cannot handle the stress any longer. 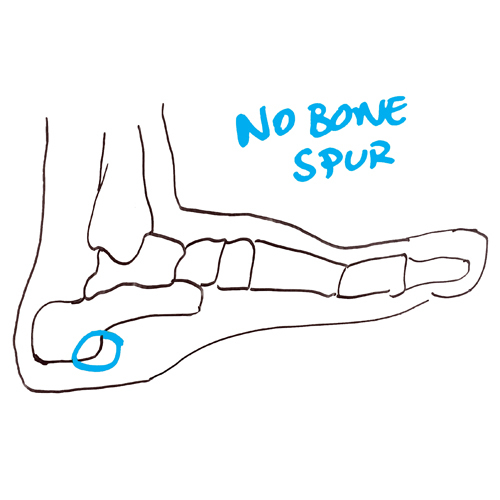 The blue circle below is where bone spurs in the foot occur. Notice here, there is no bone spur. The red circle below shows a black mass. That’s the bone spur in the foot. Bone spurs take many years to develop as other problems are often consciously ignored. Once you have the bone spur, you’ve finally developed a problem that is non-reducible (cannot be fixed). Even if you have a bone spur, there’s still hope. The good thing is that all of the issues that develop before the bone spur is present are treatable if caught within the first several years that symptoms are present. 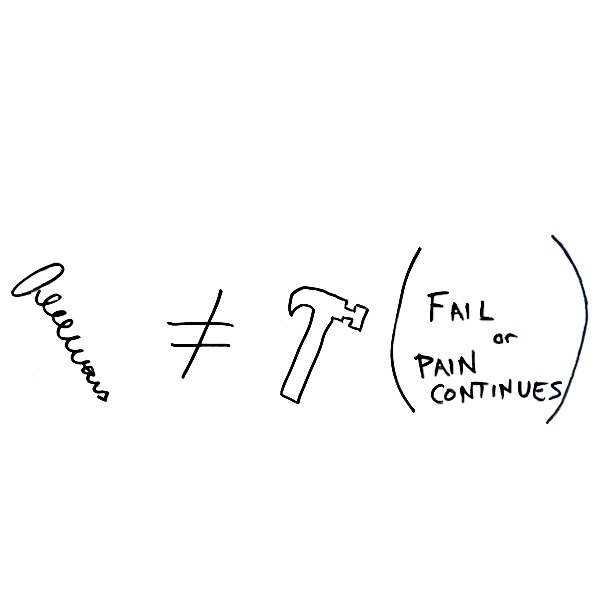 They are reducible problems (can be fixed). If you have a bone spur, you have other reducible problems. The longer you’ve had the bone spur, the symptoms, or other symptoms related to the bone spur, the more problems you have. The question becomes: What are the other problems you have? Moving forward, I’m going to use the word dysfunction instead of problem. 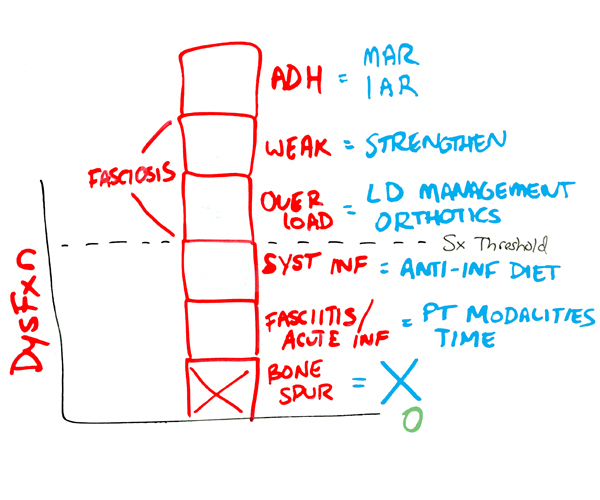 Dysfunction: musculoskeletal term for problem. In an ideal world, you would have no dysfunctions. Notice, there are no square blocks on the graph. With no blocks, you would have a nice, big, empty bucket (or capacity to do work). 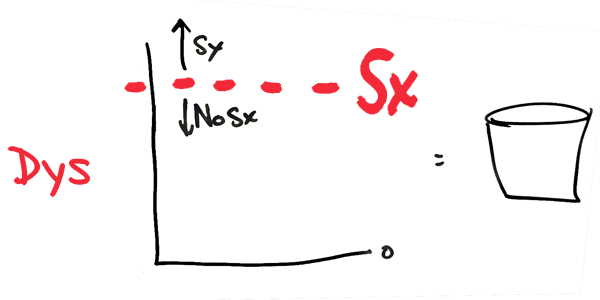 You still have a symptom threshold (the dotted line with the “Sx” to the right of it). You could undergo a trauma (like getting hit by a car), which would immediately add an “acute inflammation” dysfunction block that would put you way above the symptom threshold. Not only would you have no dysfunctions, but you would be as fit, strong, healthy, and flexible as possible. Note for Sedentary People: A lack of fitness is a dysfunction. If you are weak or don’t have stamina, your tissue has a low capacity that was a high risk data point for this bone spur to occur. Concerning your feet, the absence of a “weakness” dysfunction block means you’d be able to do 15 repetitions of a moving your body weight up and down on your foot. 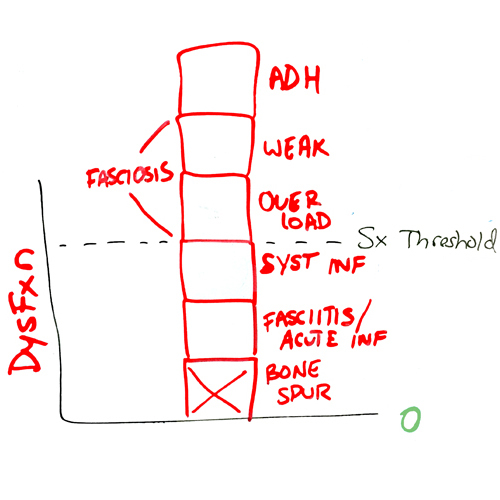 The absence of an “adhesion” dysfunction block means you’d have 5″ of ankle dorsiflexion. This is the minimum range for normal, healthy ankle dorsiflexion. The absence of any “big toe” dysfunction blocks means you’d have 60 degrees of big toe extension. This is the minimum range for normal, healthy big toe extension. Your capacity would be high enough that you’d have no symptoms no matter what activity you did. 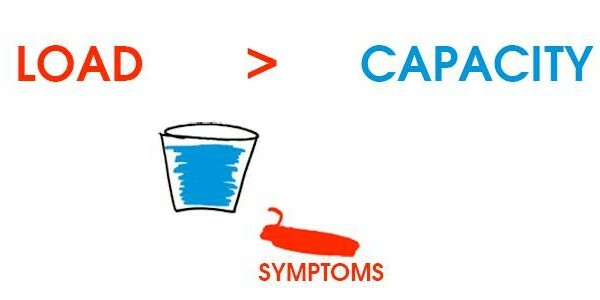 Being symptom-free suggests your bucket is big enough to handle your life activities. Symptoms are your body’s way of telling you that you’re overloading something by spilling out of your bucket when load (the work you do) exceeds capacity (the work you’re able to do). 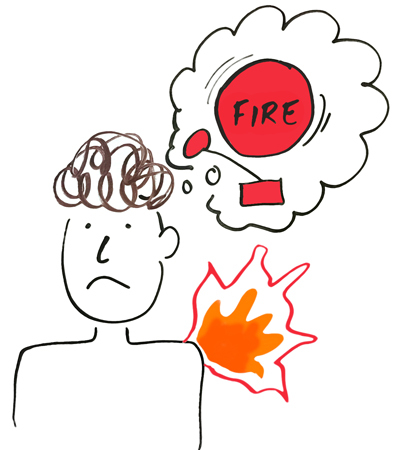 Symptoms are your body’s fire alarm when there’s a fire. Normally, you can’t overload something unless there’s a dysfunction. Evidence of this phenomenon is observing children. Children can play outside all day, running themselves into a stupor, + not feel pain. This is because most children don’t have problems. If you have a bone spur, you’ve very likely been having your symptoms for a long time. Maybe you’ve ignored them. Or maybe you’ve pursued multiple therapies + solutions. None of which resolved you completely. Usually, a lack of complete resolution is a non-complete diagnosis. Unless you have a non-reducible dysfunction that is not treatable. Nonetheless, the bone spur means that you must identify all dysfunction blocks in order to have any real chance at getting out of pain. A failure to do so means you’ll be riding the medical merry-go-round for the long term. Let’s move from more general concepts into more specifics on bone spurs. Remember that a bone spur is caused by an overgrowth of bone resulting from excessive stress on that bone. For a bone spur in the foot, that means all of the tissue that attach to the calcaneal tuberosity (where the bone spur grows from. The calcaneal tuberosity is also right next to where plantar fasciitis (the symptoms would be a 1/2″ closer to the toes) or an inflamed fat pad (the symptoms would be 1″ closer to the heel) occurs. When considering what tissue is responsible for the excessive stress on the calcaneal tuberosity, it’s important to make a full list of all tissues present at the location of the symptoms. That list includes the plantar aponeurosis, flexor digitorum brevis, the long plantar ligament, quadratus plantae, and the plantar fascia. The tendons for tibialis posterior, flexor digitorum longus, and flexor hallucis longus are nearby + should be considered with this condition. Plantar fasciitis occurs first. The plantar fascia becomes inflamed from overload. Plantar fasciosis occurs next. The body’s attempt to recover with inflammation have failed due to sustained overload over time. Therefore, fasciosis sets in. Fasciosis: soft-tissue degeneration. The bone spur occurs last. Activity that continues with symptoms present causes the body to continue to adapt in ways that harm one’s potential for future activity. Bone spur pain is typically a combination of fasciitis, fasciosis, and other factors listed below. A fairly comprehensive pain graph of all dysfunctions with a bone spur would look similar to this. Don’t get confused by the graph. Just know that each block is a different dysfunction that has a different solution to address it. 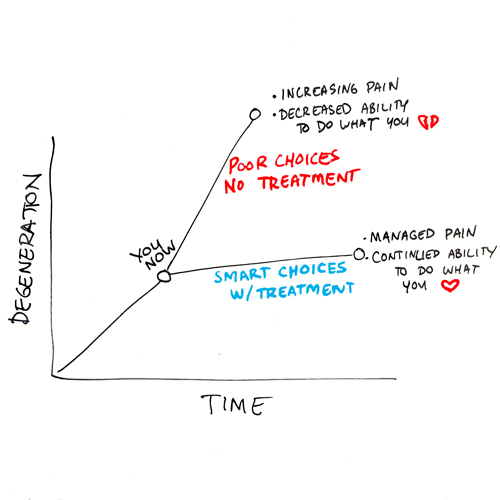 To effectively resolve any pain, but especially a chronic one, each pathology (or block) needs to be addressed with the gold-standard, sweet spot solution. If you have a nail, common sense says you’d use a hammer on that nail. You wouldn’t use a screwdriver. You might be able to make the screwdriver on the nail work with lots of cursing, sweating, + hurting hands, but it’s way less effective. 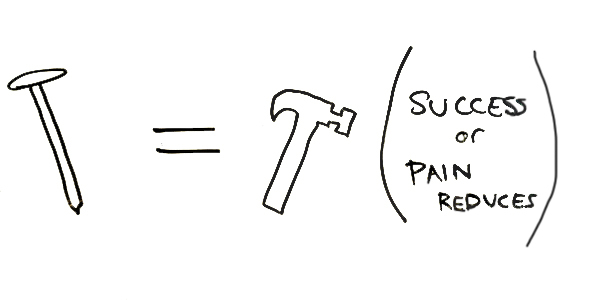 The hammer is the “Most Effective Tx (treatment)” for the problem of the nail. 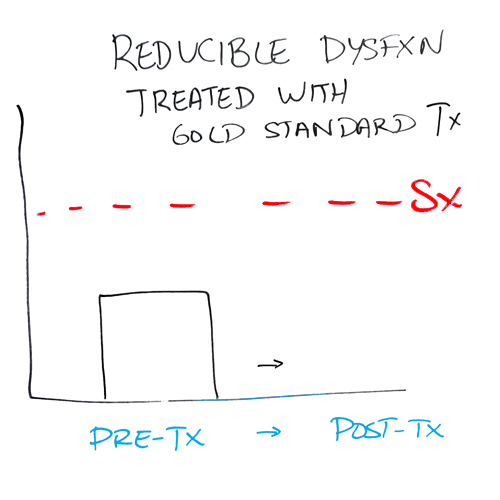 The screwdriver is the “Least Effective Tx”. When you use a hammer on a nail, you make your job complete. If the nail were your problem, the dysfunction block would be gone. 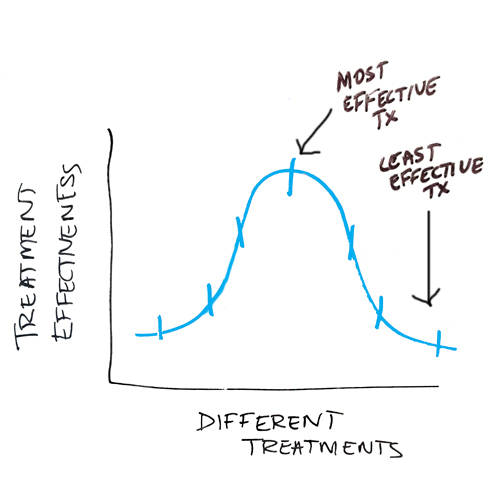 Using a gold standard treatment to completely reduce (make disappear) a problem is the goal for any healthcare problem. Unfortunately, there is no gold standard treatment for a bone spur. You can only expect to experience diminishing returns due to the nature of the problem. Surgery can only reduce a bone spur dysfunction block. It cannot completely remove it. This is because no human being, no surgeon, however competent they are, is God + can make you baby-fresh again. 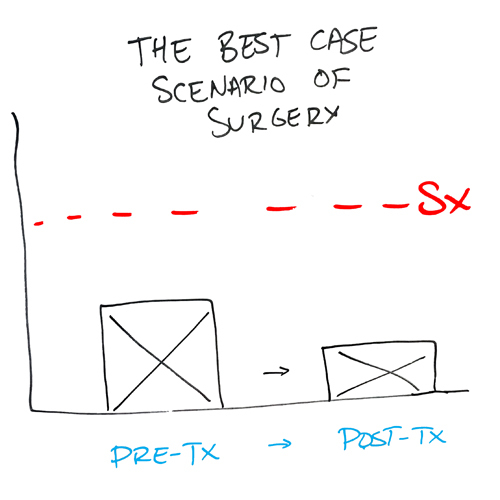 Reduction is a best-case scenario with surgery. 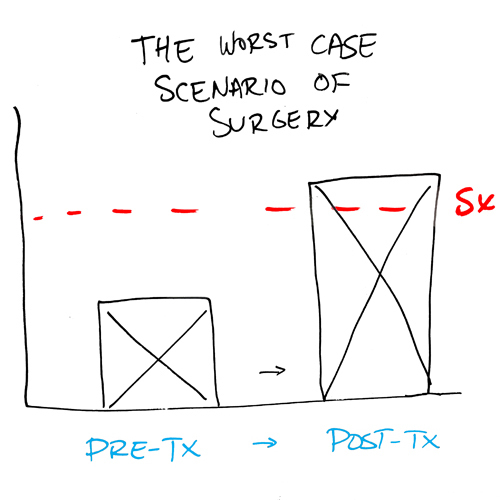 The cost, or risk, of surgery, is that the block gets bigger. This is a very real possibility. Whenever it comes to non-reducible dysfunction blocks, I always recommend addressing all other, much-easier-to-address reducible blocks in order to see where symptoms lie. It is probable that most bone spur symptoms will go away when the other variables are resolved. Not only that, but the high risk of the bone spur (the degeneration) growing over time will become smaller. Before I go into the specifics of each gold standard, I highly recommend you follow the 7 steps at the bottom of this post + find someone to manage these treatments for you. The gold standard for the dysfunction adhesion is Manual Adhesion Release (MAR) + Instrument Assisted Release (IAR) through an Integrative Diagnosis Dr. The gold standard for the dysfunction weakness is strengthening. This can be done through conventional physical therapy or through personal training. The gold standard for the dysfunction overload or doing too much is managing load with the help of orthotics. Sole Supports is our preferred orthotic support. The gold standard for the dysfunction systemic inflammation is an anti-inflammatory diet. This is best managed through a functional medicine doctor. A conventional primary care doctor is a waste of time for this purpose. There is no gold standard for the dysfunction bone spur. It makes inflammation go away if you have a “fasciitis/acute inflammation” block. In my experience, if cortisone makes your bone spur pain go away, it will come back. Not only that, but cortisone injected into fascia causes increased degeneration. That would be a poor choice. Orthotics can help. We highly recommend Sole Supports as the preferred brand for orthotics. Physical therapy (PT) modalities such as physical therapy, ultrasound, electronic stimulation, or TENS units can help reduce pain in the short-term, but have been not been proven to reduce the size of any dysfunction or block. There is some interesting research coming out behind extra corporeal shock wave therapy here + here + plasma injections here. To address your bone spur + its symptoms, you need to find a trusted musculoskeletal health provider. If you live in North Jersey or New York City, I suggest you come see us at Barefoot Rehab. I’ve found that there are trusted providers in the fields of orthopedics, chiropractic, physical therapy, or even massage therapy. My #1 choice for finding one of these providers is through Integrative Diagnosis. Get referrals for doctors near you. Schedule an initial visit with 2-3 doctors to assess trust + get opinions. Judge for yourself who makes the most sense. Ask each provider the expectations for care + a timeline to observe that expectation. Hand over the keys to the car as you do everything that one (or multiple providers) say. After those timelines finish, judge success + either continue to be managed under those providers’ care OR ask for more referrals. Rinse, repeat until you’ve found results. Unfortunately, this process can cost time, money, + energy. You’re hoping that you have skilled providers near you. I know of no other way. If you’re interested, you can read The 7 Biggest Mistakes People Make When Choosing a Pain Doctor to save yourself some of that trouble. 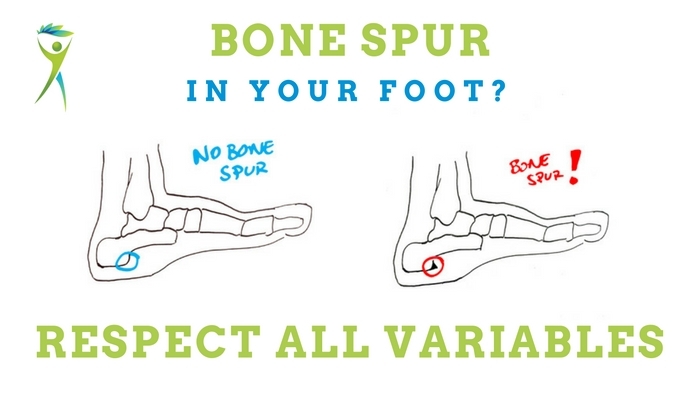 What has your experience been with a bone spur? What have you tried for your pain? Please share if you’re comfortable sharing.